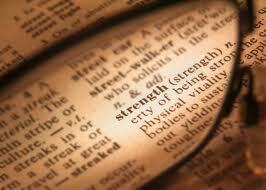 To grow as a leader, or in any endeavor, it is essential to build upon your strengths. And in order to do that, you must be aware of your strengths – the specific things that make you you, that make you great, and that make you good at what you do. This awareness is something many of us have trouble identifying and embracing. A great way to find your strengths is to do some research. To spend time in reflection; to look around you and notice what you love, what you excel at, where you truly shine. Your research should include asking others – to reach out to those people who know you really well and ask them to notice and to list the best things that make you you. Noticing the strengths in others, and contemplating which of those you might also possess, is another way to find your strengths. Recently I asked a LinkedIn question, “What is your greatest strength?” The answers varied, to say the least – some with humor, some with seemingly intense reflection, some with both humor and reflection. But the answers all made me think more carefully about my own strengths – the things that make me me and the things that I want to build upon and enhance. The list was extensive and thought provoking, with strengths noted such as: creativity, flexibility, attitude, and compassion, to name a few. Obviously, simply becoming aware of our strengths is not enough. We need to learn how to proudly own these strengths, and then we need to learn how to build upon them. It is helpful to watch yourself use your strengths and to notice the positive outcomes. Or to look for similar strengths in others and acknowledge how great they are. And then it is essential to further hone your strengths and find opportunities to use your strengths so that you shine. As we offered last year in our blog, it is important to Be Yourself – to find the way to do the things you do from your own strength and style. At the same time, too much of any good thing can become a bad thing. We often find that our coaching clients’ greatest strengths can also become their greatest weaknesses when used in excess or inappropriately. The client who is extremely vivacious and engaging may say too much at times. The client who is a strong, decisive leader may run over people unknowingly (or even knowingly). The client who is able to juggle everything may have too much on her plate and look frazzled. Part of knowing, owning, and building upon our strengths is also learning when to step back from our strengths. To let someone else be the strong one, or to step outside of your comfort zone and use a less-developed part of your personality or style instead. It is important to acknowledge our greatest strengths – to be willing to own what we’re good at and to let that be a guiding force for who we are, how we lead, and what we do. It is also important to use our greatest strengths by choice – that’s Thoughtful Leadership. I’d love to hear what your greatest strength is. For a complimentary consultation on finding, and building on, your greatest strength through coaching, contact Lisa at lkohn@chatsworthconsulting.com.